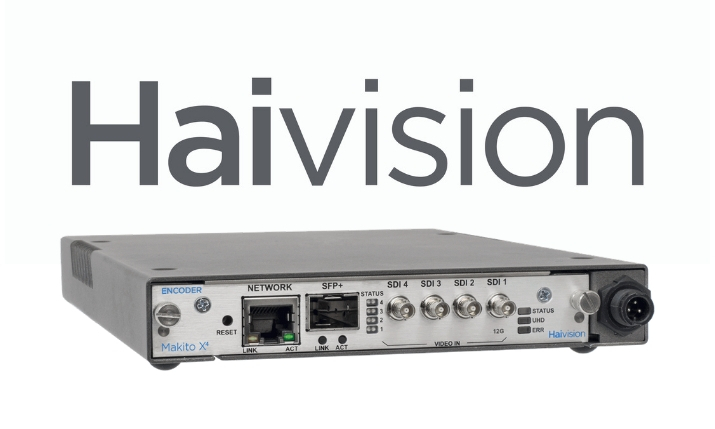 Video streaming technology developer Haivision unveiled its latest Makito encoder on Tuesday. The Makito X4 4K UHD HEVC/H.264 Video Encoder. The Makito X4 Video Encoder can support 4K UHD or quad HD at a full 60 frames per second while also offering the company’s highest available encoding density at up to 84 HD inputs (or 21 4K/UHD inputs) and 168 encoding cores in a single 4RU chassis. The product features HEVC/H.265 and AVC/H.264 live encoding supporting 4:2:2 10 bit color; the flexibility to deliver HEVC or H.264 streams at multiple bitrates to multiple locations; and native SRT support. Haivision also believes that the encoder is ideal for at-home production workflows. According to the official release, the Makito X4 is based on Haivision’s new MX4 HEVC/H.264 programmable 8 core encoding engine. It also offers a future-proof platform set to adapt to the technology drivers in the broadcast industry with support for HDR, SMPTE 2110, and other advanced video encoding features to come in future releases.